Within my first two years of undergrad, I’ve been lucky enough to participate in two research programs, at the UNC Institute of Marine Sciences in Morehead City, North Carolina, and at UT’s Marine Science Institute in Port Aransas, Texas. Despite nearly 1000 miles separating the two places, there were several striking similarities. Between the charmingly goofy professors, the diverse group of undergrads (many of which are sometimes crammed into one small dorm room), and the laid back atmosphere of beach towns, I felt like I have a pretty good knowledge of what a typical marine science research extravaganza entailed, that is, until all of that was crammed onto a 135-foot boat. 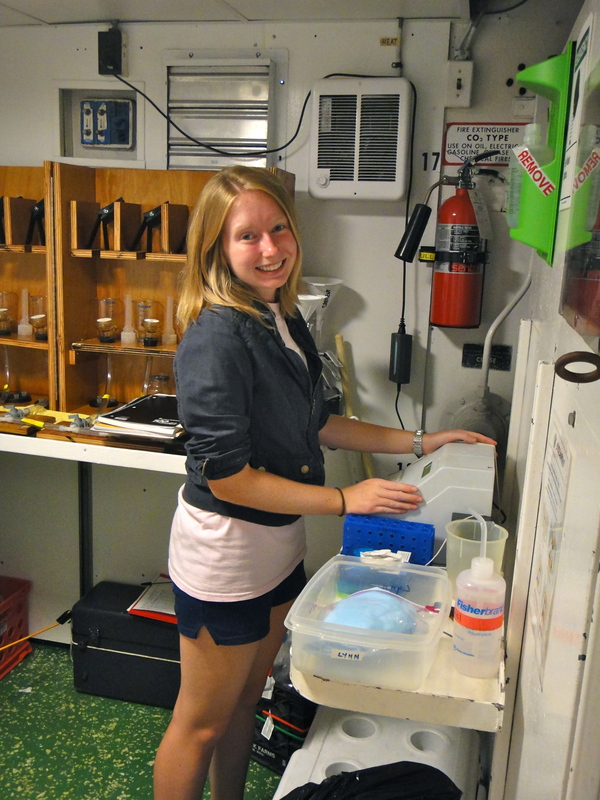 The R/V Cape Hatteras, despite belonging to Duke University, became a comfortable, if cramped, workplace and home to me for an entire month while sailing along the northern Gulf of Mexico. For an undergraduate, this is the equivalent of a social death sentence, with no cell phone or facebook to fall back on. However, it cleared a path for creativity to take over: whether that meant recreating quiz game shows, well-placed water gun attacks, or creating masterpieces from paper and pipe cleaners. On a boat, creativity is necessary in every aspect of life, most importantly in research. Even on land, research is inevitably full of mess-ups, dead ends and do-overs. 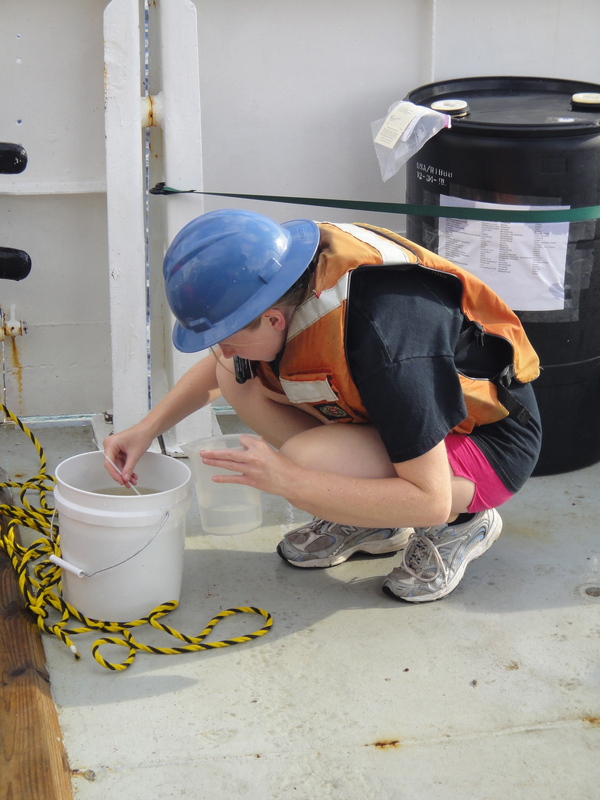 For a month before heading into the Gulf, learning to use the complex equipment and conducting mini-experiments with phytoplankton samples was enjoyable. On a boat, those same tools became headaches. There was always at least one machine that did not work as it should. Samples were lost or mislabeled. At times, stress and tension permeated the atmosphere of the slightly-too-small lab. These difficulties caused the subject of my research to change twice. Although I hadn’t been working with diatom diazotroph associations (DDAs) for my entire life, I had invested a great deal of time reading about the intricate details of their lives. I knew what they looked like, where they were found, and why they even stayed together in the first place. I was all about DDAs, and excited to see a real one up close for the first time. However, two sampling days into the cruise and not a DDA in sight. Aside from that, the combination of the smell of formaldehyde and staring down an episcope for a half hour at a time was making me nauseous. So after a month of preparing to enumerate DDAs, the entire project was scrapped. 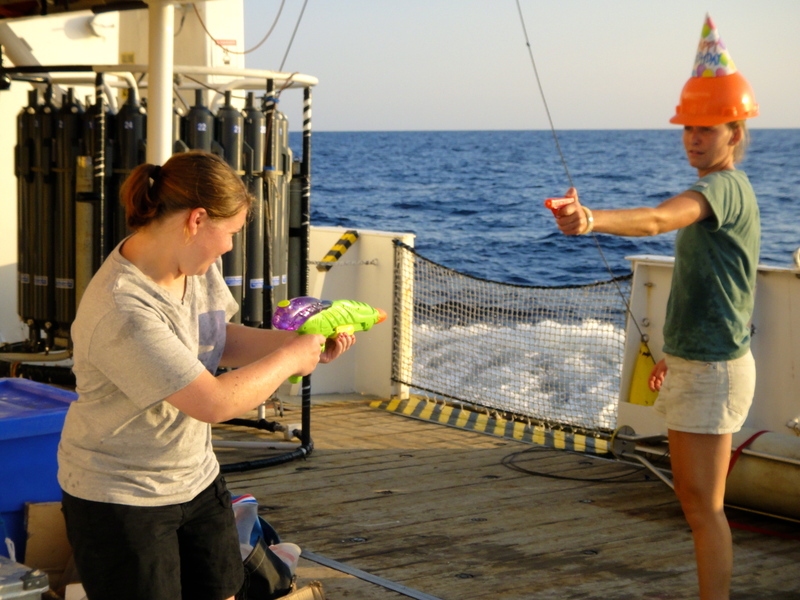 We would later in the cruise find a region of abundant DDAs, but that’s just how it goes. My next project involved measuring the amount of nitrogen fixed by Trichodesmium colonies at various light levels. Although I had no experience with Tricho, I was ready to take it on nonetheless because the results were immediate; even if sampling required me waking up just before dawn and took the majority of my time at each station. However, with no way to compare the productivity or size of each colony, it was difficult to get good results. In fact, I had found the opposite results of what was expected. And so the topic of my research was changed for the second time. My research ended up becoming similar to my last reasearch project involving statistical analysis on the abundance of prokaryotes. In the end, I was able to draw on the many hours I spend in the library at the UNC Institute of Marine Sciences to piece the data together and conduct regression analyses. After almost a summer of researching different topics I was able to pull together a project in two weeks that made for a successful presentation and also landed me a trip to the 2012 Ocean Sciences Meeting! So if anyone asks whether I regret all of those weeks researching DDAs and Trichodesmium, I would probably say no, because for all I know the same topics could come up again the next time I do research. The most important thing I have learned from each of my projects is that experiences build on one another. Eventually, I will be able to tackle every project that I put my mind to, even miles offshore. So like I said, it takes a special person to be a phytoplankton ecologist, whether or not that special person is me. Alex Snedeker is currently a junior at the University of North Carolina at Chapel Hill, majoring in Environmental Science and minoring in Marine Science.